Wedding debt is an awful gift to receive after you say I do. It is also a stressful way to start your marriage especially when the number one reason for a marriage to fall apart is not because of infidelity -- it is because of money woes. You found the love of your life and you planned the wedding of your dreams. To keep family members happy on both sides, you even incorporated many family traditions and perhaps even created some of your own along the way. You said your vows before your family and friends and now you're a married couple. Waiting for your big day may have appeared like an eternity especially with all of the planning involved leading up to your big day. However all of the planning is worth it when you get to enjoy life together. There's a sense of pride knowing you went from single to engaged to married. Now with your wedding out of the way, you're enjoying waking up to the love of your life and you are looking forward to sharing a lifetime of countless memories together. However what you were not looking forward to is a mountain of wedding debt. It is easy to get caught up in planning your wedding and spending more than you've anticipated especially with vendors enticing you with too good to be true promotions that make you spend more. 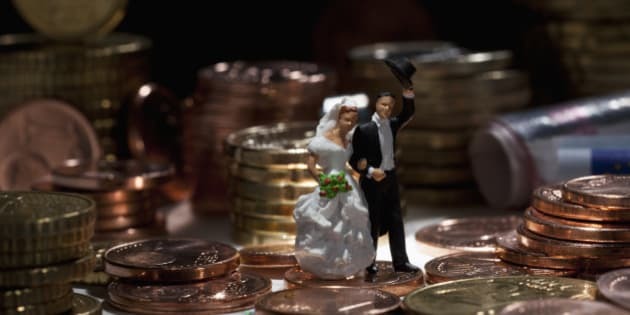 Even creating a small budget for your wedding can be costly considering the average wedding in Canada costs $30,717 according to a recent Weddingbells.ca survey. A major contributor to under budgeting is a variety of wedding expenses engaged couples did not factor in such as the marriage license, alterations for your dress/tuxedo, permits to take pictures in your favourite park and many other additional expenses. Go online to view the most recent statement of your credit card account. Make a plan to work towards paying off your debt. The monetary gifts you received at your wedding can help you to start your marriage off on a strong financial foundation. So take these gifts and apply it towards your wedding debt. Your bank account will thank you! Sit down with your better half and plan your financial future together. Create a budget to reevaluate your spending and financial obligations. Don't get frustrated if you do not see eye to eye at first -- everyone is different and practice makes perfect! Let's face it, your wedding was the most expensive party you've ever thrown. It cost you thousands of dollars, and now you're trying to pick up the tab responsibly. To help you achieve your debt management goals in a timely fashion, now is a good time to reduce your monthly entertainment budget. The extra money you save can be applied to your wedding debt. Paying only the minimum payment will get you nowhere fast because of high interest rates. If you want to shrink your debt in record time, you need to pay more than the minimum payment on your credit card. When you do this, you will notice your principal balance shrink before your eyes. If you follow the above tips in your marriage you will not only slay your debt, you will build a strong financial foundation for your union. When you put your wedding debt behind you, it will free you up to focus on other financial goals you may have. Every payment you make on your debt is a step in the right direction towards your financial freedom.